Samsung Galaxy S Duos GT-S7562 recently received the latest official XXBMJ1 Android 4.0.4 ICS firmware. The latest firmware build version is S7562XXBMJ1. The Galaxy S Duos is a mid range Galaxy Smartphone by Samsung, released back in the middle of 2012 with Android 4.0.4 ICS (Ice Cream Sandwich) and started received regular firmware update. Samsung is yet to release Jelly Bean firmware for Galaxy S Duos. If you own the device and not yet updated any latest firmware, then update this latest firmware using our simple tutorial below. The below guide will help you to download and install the S7562XXBMJ1 Android 4.0.4 ICS Firmware manually through Odin. You can also check latest available firmware for your device through OTA (over the air) from Settings-About Phone-Software Update. As the Galaxy S Duos released with the Android 4.0.4 ICS, and not yet get Jelly Bean update, you can only expect few bug fixes and performance enhancement with this update. So, want to update your Galaxy S Duos S7562 to the latest XXBMJ1 Android 4.0.4 ICS firmware? To install in official way, either you can go for OTA update as mentioned above or download firmware through the Samsung Kies utility. However, most of us prefer manual way to update official firmware. So, in this article you’ll find step by step manual guide to update the latest Android 4.0.4 XXBMJ1 firmware on your Galaxy S Duos S7562 through Odin. "The firmware is released only for the Samsung Galaxy S Duos GT-S7562 model, so don’t try this in any other android device. Check your device model number from Settings-About Phone. Also the tutorial is based on Windows PC. Follow all the pre-requisites, procedures and steps carefully to avoid breaking your phone". Samsung rolled out the firmware for the following countries. The firmware which are unbranded or not locked to any carrier, no matter of which country or region, can be flashed on any Galaxy S Duos GT-S7562 model. All the above pre-requisites are very important and must follow before proceed to installation guide. Hope you get all the above points. Now, go through the below tutorial to install Android 4.0.4 S7562XXBMJ1 official firmware on Galaxy S Duos S7562. Switch off your phone and boot Galaxy S Duos S7562 into Download Mode by pressing and holding the Volume Down+Home+Power buttons (long press until the boot screen appear), now press Volume Up key to proceed to Download Mode. Congrats! 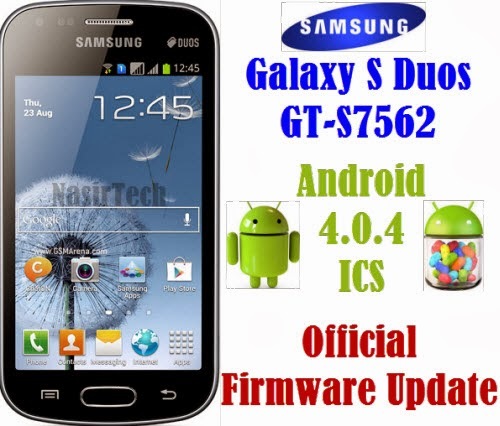 you have completed the tutorial to update Android 4.0.4 ICS official firmware on Galaxy S Duos GT-S7562. Hope you successfully done the update process. If you followed everything as mentioned in the above tutorial, then your Galaxy S Duos should now running on the latest Android 4.0.4 ICS build version XXBMJ1. You can confirm the firmware update details from Settings-About Phone. If you stuck in any point or find any issue with the download link, then feel free to contact with us using the comment form below. Any site rather than Hotfile.com where I can download these files? El archivo que se indica en el paso número 8, no indica cual es, ya que hay dos archivos,hay uno que se llama tmax.dll , y otro que se llama zlib.dll ¿cual tengo que escojer? please help me please ????? This happened to me too Sir Nasir. Now my phone is stuck on the Samsung Logo. I tried doing it again couple times but i still got the same result. What do i do now? when i open downloading mode..it shows 28 counts...(which r i tried)...so..i think i want re partion, hw can i do? where can i get pit file..after install indian firmware on my trend duos gt-s7563(c)....it says insert a valid sim. wt can i do? tnx ion advance. when i was setting the mobile it shows that gmail,maps,gapps,samsung account has stopped working.